A bag of warm Panades with some zippy Onion Sauce is a great snack. 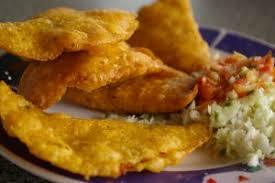 In Belize these little treats are similar to Empanades. Fairly easy to make here is how. Filling: Glaze pan with coconut oil. Add sweet pepper and cilantro. Stir fry for 20 seconds. Add Beans, Sazon, black pepper and garlic powder. Cook on high for 2 minutes. Mash Beans and Set aside to cool. Masa: Take 1 lb Tortilla Corn Flour, mix with salt and baking powder. add warm Chicken Stock and Recado until a dough is formed. Stand for 30 mins add the fat and whisk in well and check the dough if stiff add some more stock, You need a pliable dough not too wet or dry. Make small round balls with Masa. Cut plastic into 6″ squares. 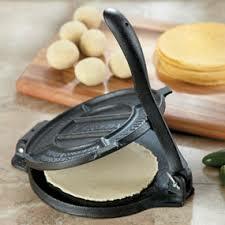 Put one piece of plastic at the bottom of a tortilla press. Put the masa ball on top of the plastic. Place the other plastic on top of the masa ball. Mash down until flat. Remove from press. Put a bit of filling in the middle of masa. Fold in half and seal edges by rubbing down in a circular motion. Remove plastic. Heat frying pan and add Coconut oil. Add in folded panades and fry on both sides for 4 minutes or until browned to your desire. Top with sauce.